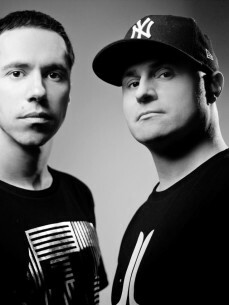 Now officially a duet, Calyx & TeeBee launched Momentum Music which marked its first release with their debut long player. The ‘Anatomy’ LP proved to be one of the most highly anticipated albums in D&B for years, gaining massive support from the scene’s big players and topping sales charts for months. ‘Anatomy’ set a whole new agenda. Following its release, Calyx & TeeBee decided to embark on non-stop tours across the globe, venturing into their now legendary and consistently in-demand joint DJ sets sporting 6 decks and 2 mixers with both players in action simultaneously. The impact of their unique performances fed back into the studio, evolving their sonic signature once again in 2012. After signing exclusively with the mighty Ram Records, they delivered their long-awaited sophomore album ‘All Or Nothing’: a kaleidoscopic array of music that sideswiped the scene with its jaw-dropping showcase of creations and collaborations. Five years in the making, this game-changer repped Calyx & TeeBee’s extensive range and abilities at a whole new level. The ensuing barrage of radio play and press exposure took the duo’s profile to unprecedented levels; with countless requests for high-profile remixes and a never-ending schedule of festival appearances, both their following and overall reputation reached an audience that transcended the genre. The pair ended an amazing year with an avalanche of wins at the most respected awards ceremony in drum & bass: The Drum&BassArenaAwards. Home to the most dedicated and discerning fans on the planet, the brand’s community voted its leading single ‘Elevate This Sound’ (the first track that Calyx ever recorded his own vocals on) for Best Single and the second single ‘Pure Gold’ won Best Video. The duo were also recognised with the most coveted trophy possible: Best Producers. Adding to this gold-rush momentum, the duo were also shortlisted in BBC Radio1’s Top 5 best Essential Mixes of 2012 - a moment of scene history, it’s the first time a drum & bass artist’s Essential Mix has ever achieved such recognition.